We have previously reported LINE's potential in the messaging app battle and also mobile commerce. 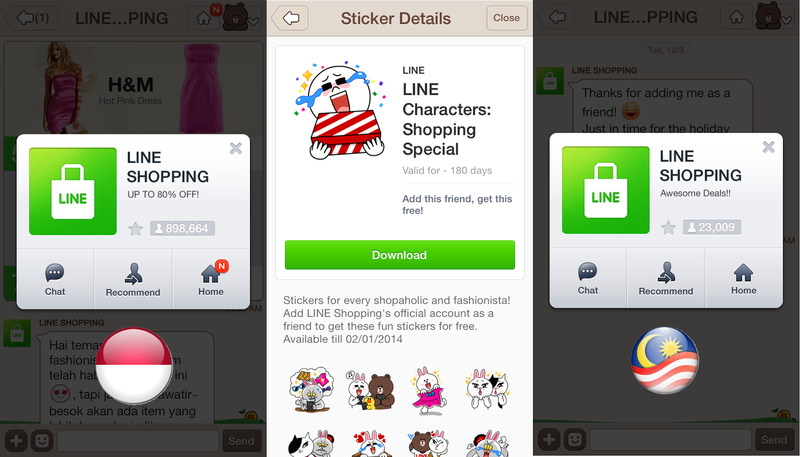 LINE has been growing aggressively since then by registering 300 million users worldwide in November 2013. We have previously reported LINE's potential in the messaging app battle and also mobile commerce. LINE has been growing aggressively since then by registering 300 million users worldwide in November 2013, doubled its base since late April in just seven months. Last week, LINE has launched LINE Shopping in Indonesia which makes it even more interesting especially for e-commerce businesses. As opposed to the official accounts operated by brand owner or merchant, LINE Shopping is managed by LINE team, aggregating online merchants and promoting deals exclusively for LINE users. 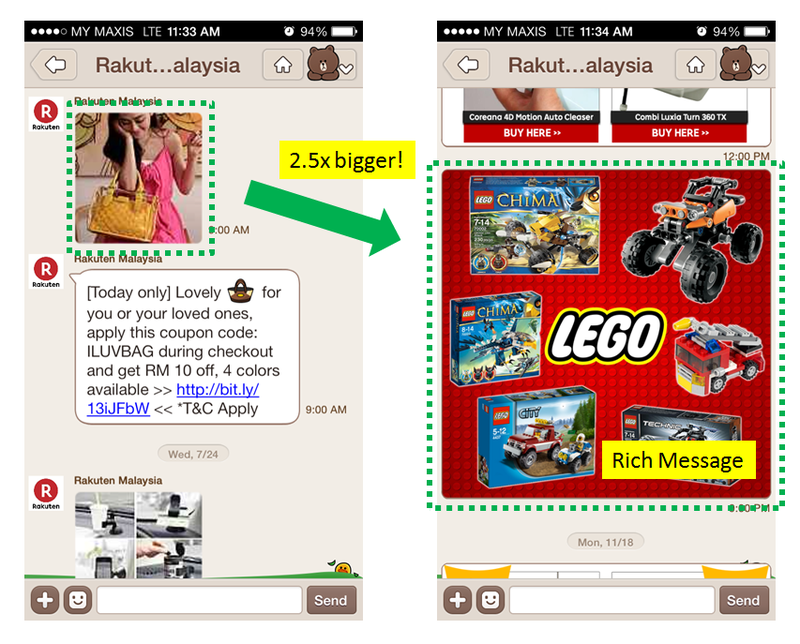 LINE Shopping has also been launched in Malaysia today, the second country after Indonesia. For online merchants, the motivation to promote their deals via LINE shopping is to reach out to a huge base of users on mobile, and LINE has proven track record in scaling its subscribers. Just look at LINE Shopping Indonesia (screenshot above), they have accumulated close to 900,000 subscribers within just 1 week after launch on 26 November. What is LINE's formula behind growing its subscribers in such pace? The answer is simple, Stickers. LINE has introduced a set of adorable shopping-themed stickers above, in which you need to follow LINE Shopping account prior to downloading the stickers and kawaii your friends on LINE. From what we can observe so far, e-commerce sites like Groupon, Rakuten, Qoo10 and Berrybenka in Indonesia have participated in LINE Shopping by offering attractive product deals. At the same time, LINE has rolled out Rich Message for the first time starting from this region. It is basically a large clickable (or should we say, touchable) image that send traffic to designated URLs, something that is not made available by LINE's nearest competitors yet. According to our sources, the first H&M deal blasted on LINE Shopping Indonesia (with sizable inventory) has been sold out within 4 hours, on mobile it is. Deal attractiveness no doubt is a big factor but LINE has the capability to send instant traffic with full control over timing to e-commerce mobile websites. 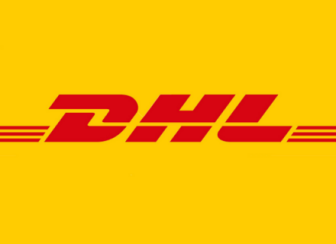 Therefore, flash deals or time sensitive offers would potentially work very well on LINE. The only challenge here is the mobile shopping experience especially if the payment pages on the banking sites are not mobile-optimized yet. Read also: Did Maybank2u crash Black Friday party? According to Wind Koh, Head of LINE Malaysia, they are working with selected partners like Groupon, Lazada, Zalora, Rakuten, Superbuy to kick start LINE Shopping in Malaysia. For now, LINE is working closely with merchant partners during this "trial phase" and the charging model has not been fixed yet. Similar with LINE Shopping Indonesia, the Malaysia counterpart is also going to focus on apparel, accessories, beauty and gadgets during the early stages. We are expecting 1 million subscribers on LINE Shopping Malaysia within a "short period" and this will be a very good platform for online merchants to reach out mobile users. On top of that, LINE has a proven track record of enabling high engagements, even better than other prominent social networks. Besides driving instant traffic to e-commerce mobile websites, you can also imagine brick and mortars leveraging on LINE for online-to-offline marketing activities, and it is much more direct and instant in relative to say, Groupon. In conclusion, LINE is developing itself to become one of the huge advertising media after Google and Facebook, and LINE has the potential to do better than anyone on mobile (at least, that is until Instagram enable something like "Rich Message").